Proper use of binoculars can lead to trophy opportunities regardless of the terrain. Aside from the actual weapon of choice, hunting binoculars are perhaps the most important tool a hunter can pull out of the arsenal. Of course, just wearing binoculars around a neck will not improve a hunter’s odds of success, as they need to be utilized in the right way to take down mature animals that pack around a lot of good eating meat, as well as large racks. 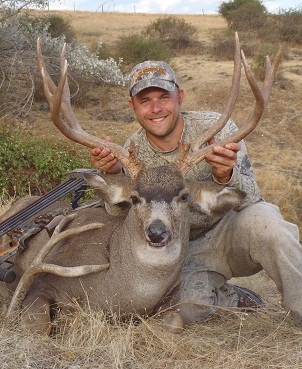 Here we will discuss how to utilize hunting binoculars to maximize your hunting success. The first thing you need to do in order to make yourself a better hunter by using binoculars is to purchase a nice set. This does not mean you need the best binoculars ever built; it just means you need some quality glass that you and your eyes will be comfortable enough to use for long periods of time. Packing quality hunting binoculars does not immediately make a person a better hunter. Binoculars are most commonly used once an animal has been seen, and is usually heading in the other direction. This is better than just using a rifle to shoot it without being able to properly judge it, but it is definitely not the best use of hunting binoculars. 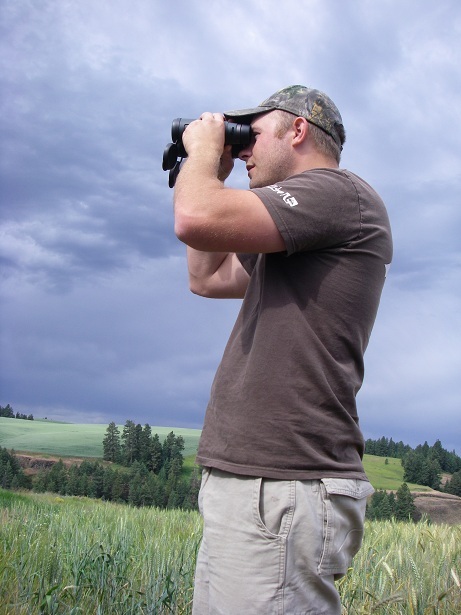 What are the best ways to use hunting binoculars? Finding and identifying animals. Be sure to use binoculars often to make sure you find the deer before they find you. Regardless of the animal you are hunting, the main object and the best chance of getting an ethical shot is to see the animal before they detect you. Of course they have their ears and nose to rely on in addition to their eyes, so it is best to find them from a distance. To make it hard on us hunters, most game animals tend to blend in with their habitats, which makes there very hard to detect with the naked eye. Thank the hunting gods for binoculars. If it is daylight before you leave your hunting vehicle, this is the place to begin using your binoculars. You want to pick the area apart before you enter to make sure you do not scare your game away as soon as you open the door. That’s right; begin your glassing before you leave your vehicle. Look both near and far. You will be amazed at how hard a deer is to see in the middle of a green field before there is full light. The area you are hunting will also depict how you can use your hunting binoculars. Obviously, the more open an area, the more land you will be able to cover from one spot. If you are hunting an area that offers a lot of cover, that means you will have to look even harder, as the animals have more area to hide. You can glass an area one minute and see nothing, than wait another minute or two and see several deer that were behind brush the first glance. Once you have glassed an area with your hunting binoculars you will either find an animal, or you will not (duh). If you don’t, then you can move on, but continue to glass as you make your way. It is unbelievable how many animals you will see just be changing your angle. If you do see an animal, then you will need to judge it to determine if it is an animal you want to consider taking, depending on your standards. Once you find an animal, you then need to identify it. This is when nice hunting binoculars really shine. If it is in fact the type of game animal you are after, then use the binoculars to judge the animal and make sure it lives up to your standards. If you are able to use your binoculars to help you spot the animals before they spot you, then you will have much more time to decide on the worthiness of the animal instead of sizing him up after he is down. They almost always shrink when all you see is them running a way. If you can spot an animal that you deem worthy of hunting, but need to reduce the distance between it and you, then you are “Spot and Stalk” hunting. When stalking on an animal, you need to pick a land mark, or several, so you will know when to glass when you get there. Things look a lot different when you get closer. Once you begin to see your landmarks, then you want to begin using you binoculars to find the target before he finds you. Look for the slightest of signs; all it takes is the tip of an antler or the flicker of an ear, things you would not be able to see with the naked eye. Sometimes, they have to stand up before you can see them. In this case it is best to let them stand up on their own and then take advantage of a good shot. It is easy to put your glass up to your eyes for a few minutes, not see much, and then begin walking. If you have not experienced the advantage of finding animals you would not have found without binoculars, then it is hard to give optics the proper amount of time for them to be a huge benefit. Once you get good at using binoculars to find your game, then you will build confidence in your ability to spot game from a distance, and then you will realize the benefit you have when you see the animals before they see you. The more you find your game this way, the more time you will spend behind the glass. If you look long enough through binoculars where there are game, you will find them. 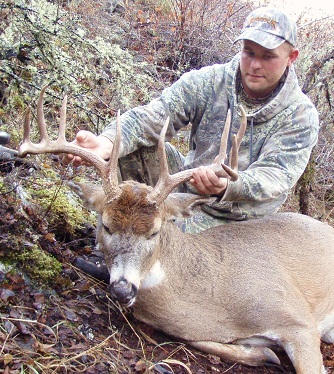 The author was able to use his binoculars to find this buck mid day and then to determine it was a shooter. The deer did not know he was being watched and Chris was able to make a good shot. In areas that are open, steep, and or nasty, the best thing to do is glass from a vantage point where you can view the area without disturbing the animals that call it home. You may have to find several of these vantage points to effectively glass the entire area, but that is better than walking it all and possibly spooking your intended target into the next county without ever realizing he was even in there. If you glass an area that you believe a bib buck lives, but fail to see him, come back in a few hours or even the next day. Chances are he is still in there as long as you are someone else has not walked through the area and chased him out. Using hunting binoculars to glass is an effective strategy to use from the time the sun begins to light up the sky, to the time the light fades away, and all day in between. Sure, you will find the most game in the mornings and evenings when deer are making their ways to and from their feeding and bedding areas. This is not the only time you should utilize your binoculars though. You should also use them throughout the day. Bedding areas are a good spot to find deer at all hours of the day. Even in brushy areas it is worthwhile to keep your optics up to your eyes as animals will often get up out of their beds throughout the day to stretch, nibble on some vegetation, kick their beds around, or even go for a drink. If you find the game in their beds, then you can formulate a plan to stalk within range if you are not close enough already, or you can put yourself in position to ambush them as they get up in the evening. The best way to get good and build confidence in your glassing abilities is to practice. The best time to do that is preseason before the hunt starts. For one thing, the game, especially mature game, is much more visible throughout the summer, so you will be able to find more, thus building your confidence in your use of binoculars. By being out in the area you plan to hunt you will also be getting a good feel for what type of animals the area holds and where they live, so you will know exactly where to be when the season starts. This is a huge benefit you will have over most other hunters who hunt aimlessly hoping to jump an animal and get a shot off as it is running away. This usually results in missed or wounded game and requires a lot more energy than using your hunting binoculars to find game. In addition to binoculars, there is not substitute for a good spotting scope; another great tool for finding and judging game. The next most important tool for a hunter after binoculars is a spotting scope. If you cannot find the animals with binoculars, then pull out the spotting scope and you will be amazed at how many deer you can miss with binoculars. A spotting scope is also worth its weight in gold once you find the animals to identify whether or not it is an animal that fits your standards or not. You can go here: Best Spotting Scopes for Hunting for a list of spotting scopes broke down into price ranges so you can get the best on you can afford. If you have not relied on you hunting binoculars in the past to find game before they find you, then you have been missing out on some great hunting opportunities. Glassing for animals is relaxing, fun, rewarding, and most of all, efficient. Once you realize this you will most likely find yourself punching your tag on some of your best trophies to date, and will be eating 100% organic meat of the best kind. 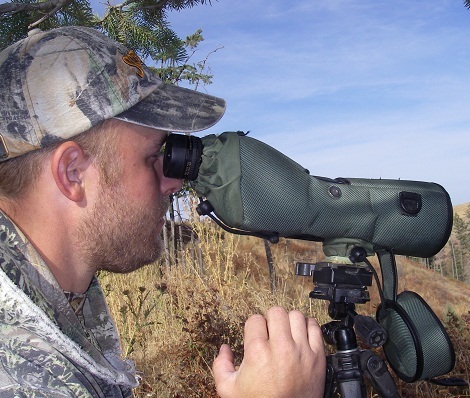 Before you can begin using hunting binoculars to spot game, you will want to make sure you have the best binoculars you can afford. Check out this page: Best Binoculars for Hunting where the best hunting binoculars have been broke down into price ranges so you can choose the best hunting binoculars that fit your budget.